Natural Healing Tools: Winter Superfoods! Super foods have a reputation for being nutritionally excellent, especially since their high levels of antioxidants can help prevent disease and provide anti-aging benefits. Although summer foods such as leafy greens and berries seem to get most of the attention, these winter super foods should not be overlooked. Pomegranates: Winter is when these nifty red fruits start to show up in stores, and for good reason. They are high in antioxidants, and can help lower your risk of developing hardened arteries or atherosclerosis. 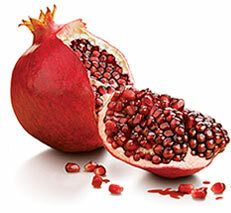 Plus, if you've never tried a pomegranate, they’re just plain fun to eat! If you’re unsure of how to eat a pomegranate, there are many places on the web that can show you step-by-step with pictures or even video, or drink pomegranate juice for an easier option. Pecans: Eyeing that pecan pie in the kitchen? You may be thinking about the delicious taste, but there is more to a pecan than it’s place in a pie. Eating a handful of pecans gives you a boost of antioxidants similar to eating cherries or cranberries, and they can help you lower your risk of weight gain when eaten in moderation. Maybe you should turn down the sugar-laden piece of pecan pie, but don’t turn your nose up at pecans! Apples: When people talk about apples during the holidays, many things come to mind, such as apple pie, apple crisp or baked apples. But how about apples for anti-aging? We all know the old adage by now that “an apple a day keeps the doctor away.” Well, apples are full of antioxidants, especially in the colorful skin. And with this sweet treat, variety matters. The apples with the highest amount of beneficial phyto-chemicals are, in order, Red Delicious, Granny Smith and Gala. Winter Squash: This winter staple is full of carotenoids, an important antioxidant group that includes alpha-carotene, beta-carotene and lutien. Winter squash also has anti-inflammatory benefits due to the amount of omega-3 fatty acids it contains. This vegetable is so versatile that you can use it as a side dish, use it to make a nice winter soup, or include it in a hearty casserole…the possibilities are endless. Plus, you can roast the seeds just like you would do with pumpkin seeds and enjoy them as a healthy snack. Cranberries: These are winter superstars, and will do a world of good when they land on your table during holiday meals or parties. In addition to having high levels of antioxidants, cranberries also help boost your immune system and provide protection against heart disease and cancer. Plus, cranberries are known for promoting urinary health as well. This winter is prime time to discover new and beneficial winter foods. Not only are they delicious, but they can help you look younger, ward off disease and eat healthier. And - don't forget to shop Natural Healing Tools special selection for winter!